Diddy Kong using Super Catch. 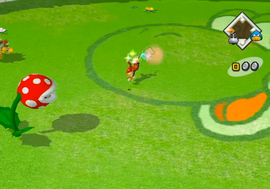 Super Catch is an ability used by Peach, Diddy Kong, and Toadsworth in Mario Superstar Baseball. It allows them to catch the ball without fumbling it, even if it was a Star Swing. This page was last edited on February 27, 2018, at 00:23.